Two stage versions of Dora the Explorer toured North America, the first being "City of Lost Toys," and the second being "Dora's Pirate Adventure." Produced by Nickelodeon and LiveNation, these productions featured live actors portraying the roles of Dora and her friends, including Boots, Diego, Isa, and the Fiesta Trio. Many of the characters wore elaborate foam costumes designed to resemble the Dora characters. Each production featured a structure similar to an episode of the television series. Where does Dora live on the show? Dora lives in a house with her Mamá and Papi, though she also often visits her Abuela (grandmother). What will Dora the Explorer teach my child? 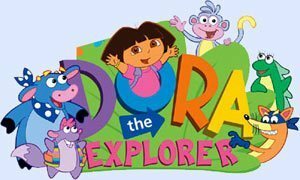 Dora the Explorer teaches children basic Spanish words and phrases along with math and music skills and physical coordination. Children also learn with Dora how to observe situations and solve problems. How does Dora the Explorer teach Spanish? In each episode of Dora the Explorer, Dora solves a problem based on specific words and phrases in conversational Spanish, which preschoolers learn as they solve the problem with her. These words and phrases include a variety of basic nouns, adjectives, and commands, such as "azul" for "blue", and "cuidado", which means "watch out". What does "lo hicimos" mean, from the song Dora and Boots sing at the end of the show? "¡Lo hicimos!" is the Spanish phrase meaning "we did it!" It means "Let's go" and is a common idiomatic phrase in Spanish. Dora is bilingual, and she demonstrates that speaking Spanish is not only a valuable tool, but also a source of pride. Together you and your child can learn some basic Spanish! Check out the Dora Playtime site.